Arulmigu Kalasalingam College of Education, Anand Nagar, Krishnankoil is an unaided self Financing College affiliated to Tamil Nadu Teachers Education University Chennai-5. It has been rendering quality teacher training and creating committed teachers to especially serve the rural folks in the economically backward areas like Watrap, Srivilliputtur for the past eight years. The Institute is taking care of its trainees drawn mostly from the under privileged and down trodden sections of society and moulding them into well trained and socially committed spiritually inspired and technically empowered teachers. Thiru T. Kalasalingam a veteran freedom fighter as the Founder Chairman. The NCTE, Bangalore granted recognition in FSRO/NCTE/B.Ed/2006-2007/9002 Dt: 08.11.2006 to the B.Ed college from the academic year 2006-2007 and the college commenced classes on 30.01.2007. The College was granted affiliation to Madurai Kamaraj University, Madurai No.CDC-5/Fr.AKCE/B.Ed/2006-2007 Dt: 12.02.2007 with effect from the academic year 2006-2007. 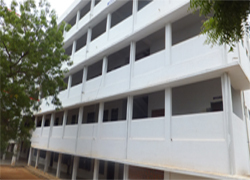 The College was transferred to Tamil Nadu Teachers Education University, Chennai- 5 with effect from 2008-2009 after the new university for Teacher Eduation was formed and established at Chennai-5. The NCTE, Bangalore granted recognition in F.SRO/NCTE/SRCAPP2402/M.Ed/TN/2016-2017/84947 Dt: 02.05.2016 to the M.Ed Programme from the academic Year 2016 - 2017. The programme was granted affiliation to Tamil Nadu Teachers Education University, Chennai -97 F.SRO/NCTE/SRCAPP2402/M.Ed/TN/2016-2017/84947 Dt: 02.05.2016 with effect from the Academic year 2016 -2017.